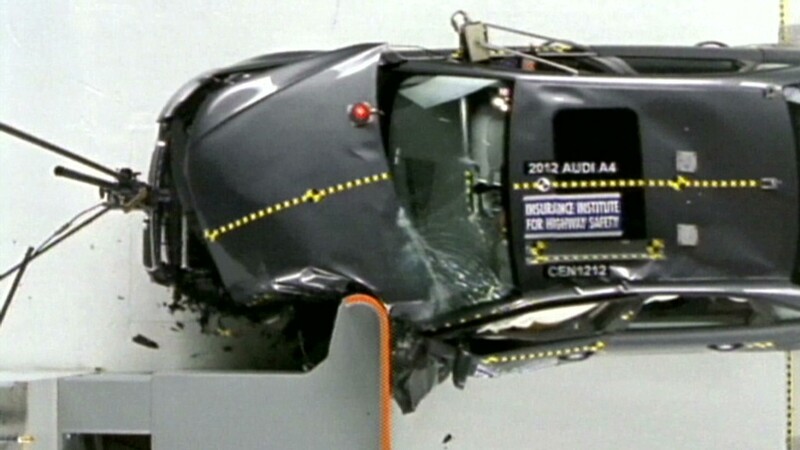 For years, cars have been doing better and better in crash tests. Now, a tough new test by the Insurance Institute for Highway Safety has given a black eye to a number of luxury and near-luxury automakers. Of 11 models tested, eight flunked a new test which is designed to mimic the most dangerous sort of frontal crash -- when a vehicle strikes another car or an object, such as a tree, with just a small portion of the front bumper. Virtually all new cars in recent years have earned good ratings from the privately funded IIHS' crash tests, as automakers have worked to improve safety. So the IIHS created the new tougher test which is known as the "small overlap" impact. "Nearly every new car performs well in other frontal crash tests conducted by the Institute and the federal government, but we still see more than 10,000 deaths in frontal crashes each year," Institute president Adrian Lund said. In the new front crash test, the vehicle, traveling at a speed of 40 miles per hour, hits a barrier with just a quarter of the driver's side bumper, concentrating the impact force in a small area and causing the vehicle to spin. About a quarter of the serious and fatal injuries seen each year are caused by "small overlap" impacts, according to the Institute. These crashes can also cause severe foot and leg injuries as the car's front wheel is pushed back into passenger compartment. The smaller impact area makes it harder for the car's steel structures to spread impact forces around the driver. The spinning motion after the impact also makes it harder for the car's airbags to protect occupants from hitting parts of the car's interior. In current front impact tests, which will still be used along with the new test, 40% of the car's front bumper strikes the barrier. Financed by auto insurers the IIHS performs a regimen of crash tests that's different from tests performed by government safety regulators. In the most recent round of IIHS results only Honda's (HMC) Acura TL and Volvo S60 earned the Institute's top rating of "good." Nissan's (NSANY) Infiniti G earned a rating of " Acceptable." The Acura TSX, BMW 3-series Ford's (F)s Lincoln MKZ and Volkswagen (VLKAF) CC earned a rating of "marginal," the second worst of four possible ratings. The Mercedes-Benz C-class, Lexus IS and ES and the Audi A4 earned the worst rating, "poor," in the new test. Most automakers with models that performed poorly in the tests pointed out that their cars still meet all federal safety standards and have done well in other crash tests. Automakers also pledged to work to do better in the test with future models. "With this new test, the Institute has raised the bar again and we will respond to this challenge as we design new vehicles," said Brian Lyons, a spokesman for Toyota Motor Sales (TM), USA, which sells Lexus vehicles. Mercedes-Benz objected to the new test. "As a leader in automotive safety, we have full confidence in the protection that the C-Class affords its occupants -- and less confidence in any test that doesn't reflect that," the German automaker said in a statement.